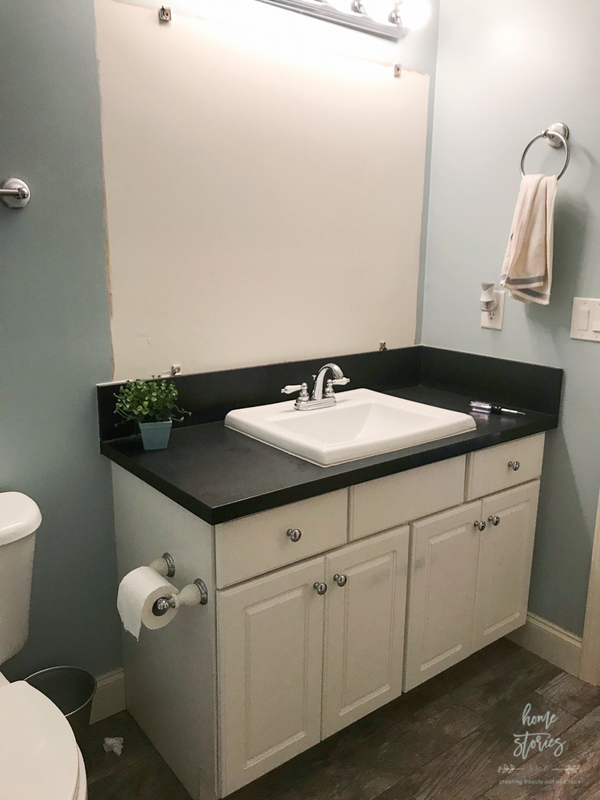 Don’t have the budget to completely gut your builder-basic bathroom? No problem! 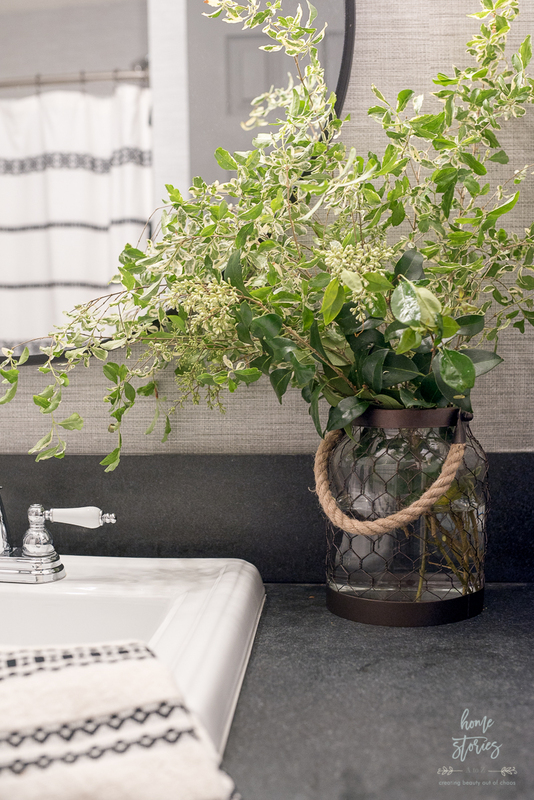 Copy these tips to create a beautiful, budget-friendly, boho farmhouse bathroom makeover! This post is sponsored by Better Homes & Gardens at Walmart and contains affiliate links. We purchased our South Carolina home last July and over the course of the year I have slowly updated many rooms to fit our style and taste. My boys’ bathroom which also doubles as the guest bathroom (so sorry guests) was in dire need of an update! The bathroom was a builder-basic bath that I had done absolutely nothing to help become less basic. 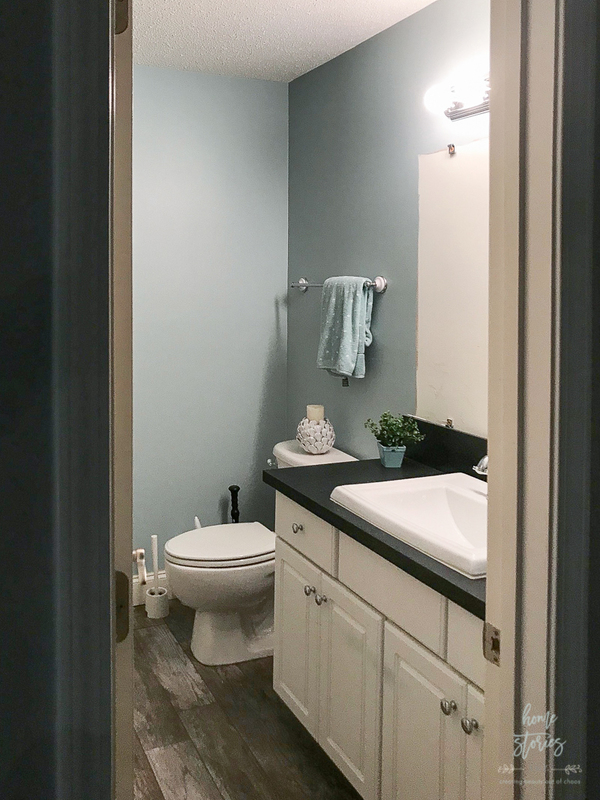 My boys were bugging me to at least hang a shower curtain and update the baby blue walls, so when Better Homes & Gardens at Walmart challenged me to refresh a room in a style that makes me happy I knew just the room to tackle! 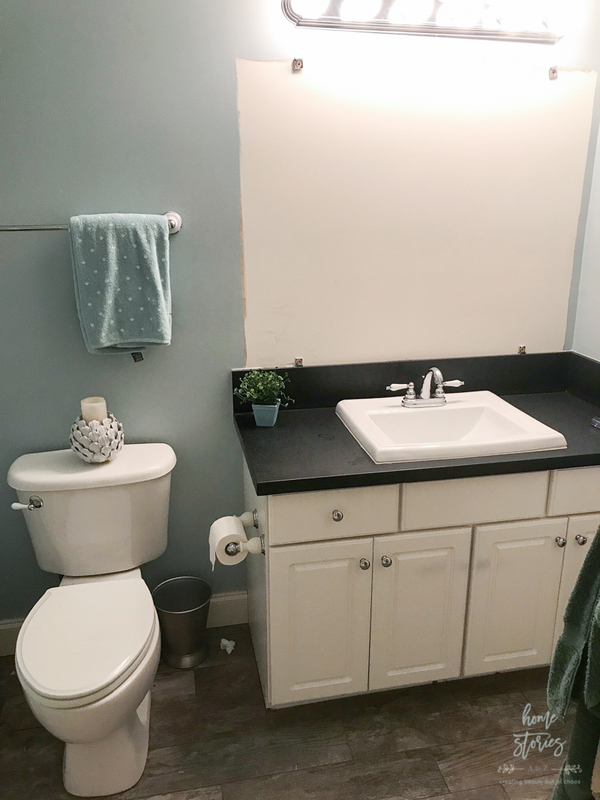 If you are anything like me, you like it when bloggers cut to the chase and show you the room befores and afters first in a blog post and then get to all of the juicy makeover details. 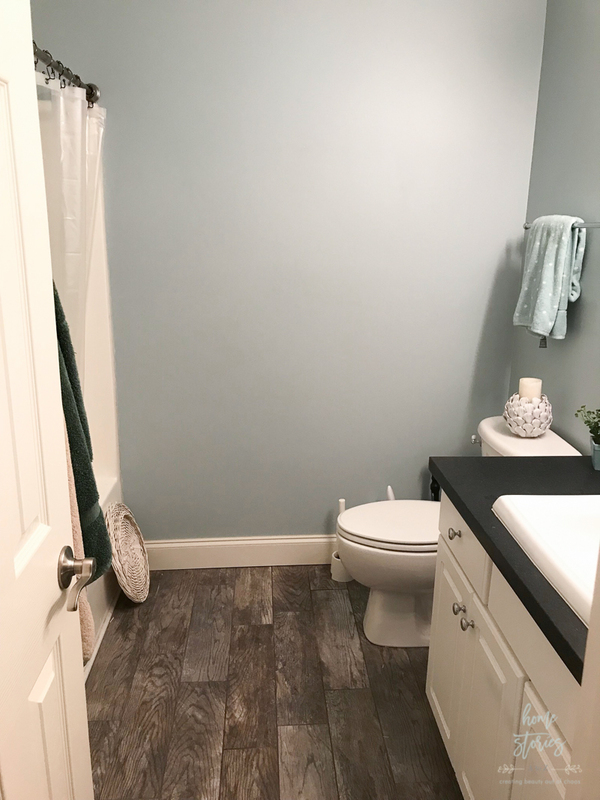 Let’s dive right in to where this room began and see what I was able to create just by adding some new accessories, wallpaper, and paint! 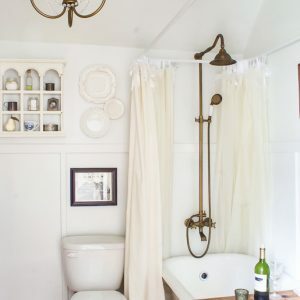 All sources for the bathroom with affiliate links can be found here on my source page. What a difference some well thought out accessories make, am I right?! My inspiration for the entire makeover began with the Better Homes & Gardens Tribal Chic Shower Curtain. 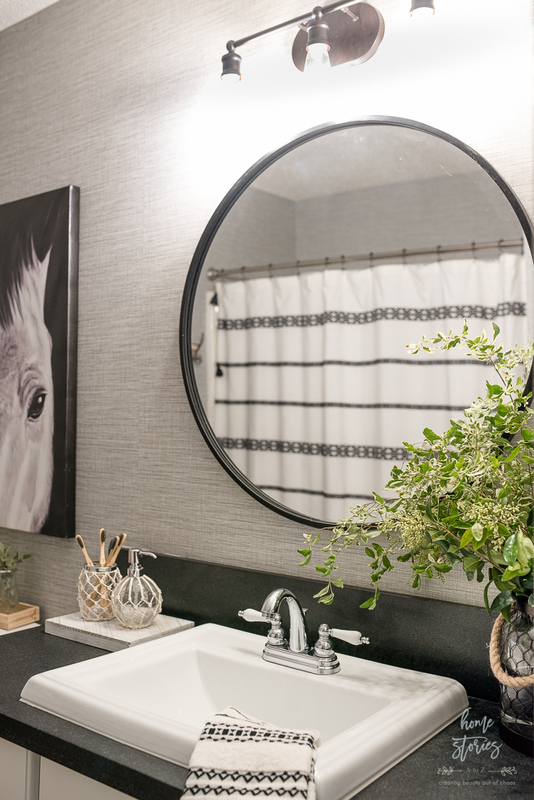 My boys requested that their bathroom have a similar masculine vibe as their dad’s home office makeover that I recently completed and this shower curtain was perfect! I love the boho farmhouse look and love that these accessories lean towards a masculine aesthetic while still appealing to the feminine sensibilities. 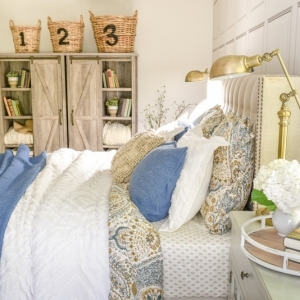 Whenever I makeover a room in our home, I look for ways to honor the entire family’s style. I think all good design should incorporate both feminine and masculine elements. 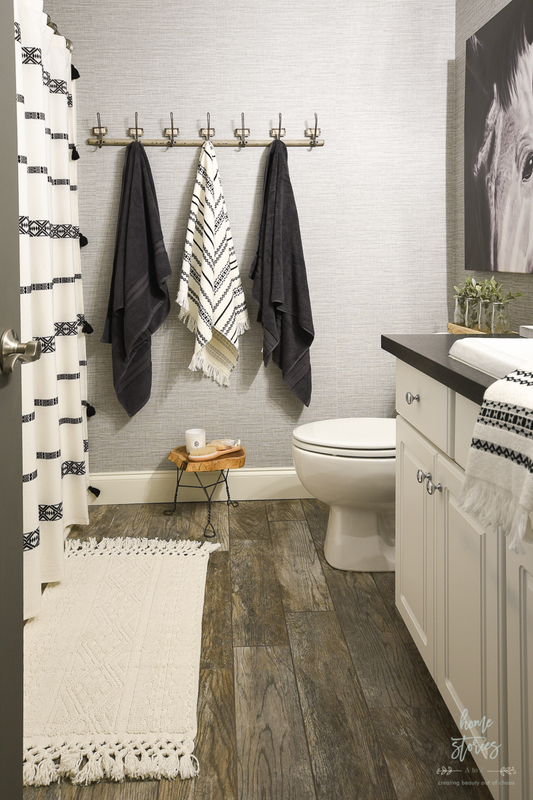 Tip 1 for Creating a Budget-Friendly Bathroom Makeover: Add texture and interest to the walls! 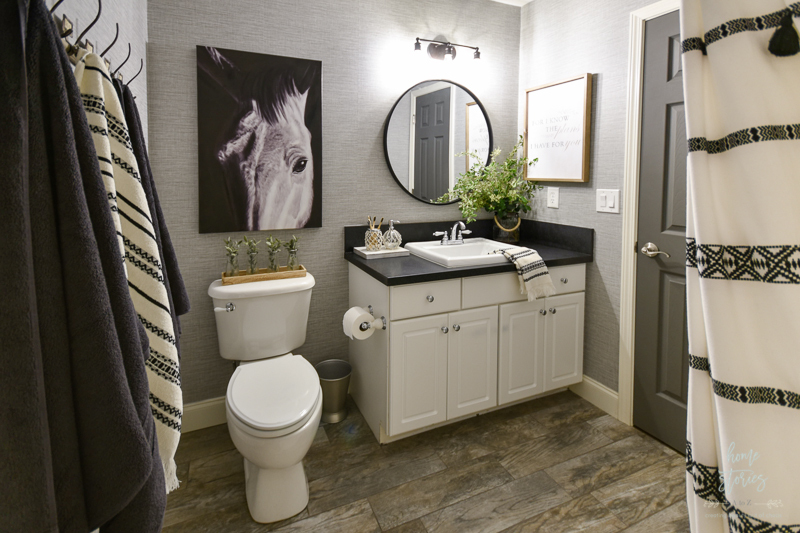 Paint, stencils, wainscoting, trim, and wallpaper spice up your space and add a layer of interest and texture to the room. I used several rolls of a peel and stick faux grosgrain wallpaper linked on my source page and absolutely love the texture and beauty it provides! Am I worried it will fall off the walls due to moisture and humidity? Why yes, yes I am. Time will tell if this was a smart decor move on my part, but I sometimes like to take risks and hope for the best! I’ll keep you updated. In the meantime, the walls look fantastic! 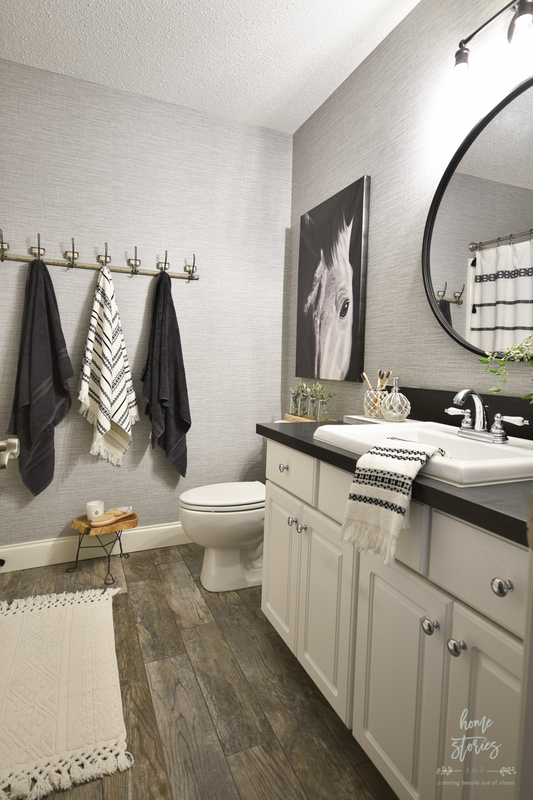 Tip 2 for Creating a Budget-Friendly Bathroom Makeover: Update the mirror and lighting. 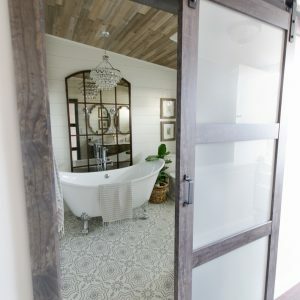 Frameless slab mirrors and inexpensive bar lighting can make your bathroom look dated. 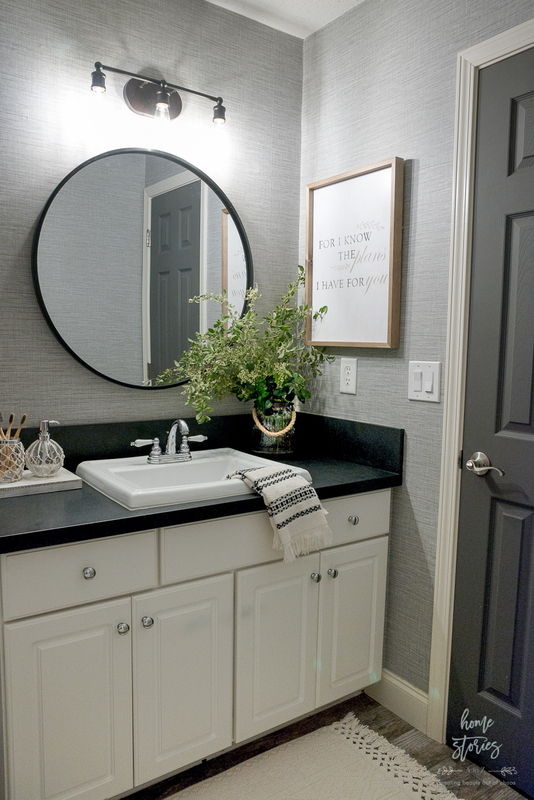 Switching out the light fixture and adding a round mirror completely transformed the look of the space. 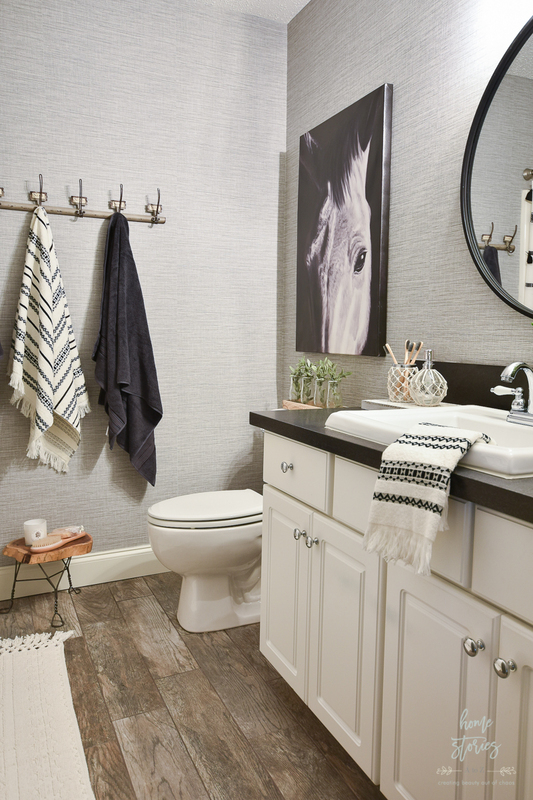 Tip 3 for Creating a Budget-Friendly Bathroom Makeover: Choose affordable accessories to complete your look! If you’ve been following my blog for any amount of time, you know that I love to create beauty on a budget and sharing my tips, tricks, deals, and finds with all of you! One of the reasons I agreed to become a Better Homes & Gardens at Walmart Influencer is that their products are adorable and insanely affordable! 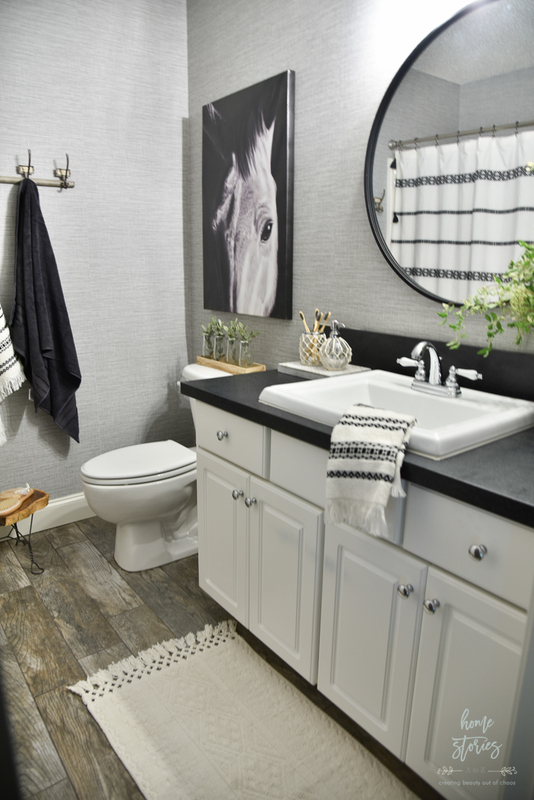 In the picture below, the tribal chic hand towel, nautical lantern turned vase, tribal chic bath rug, and nautical soap dispenser and toothbrush holder are all from the Better Homes & Gardens at Walmart collection. 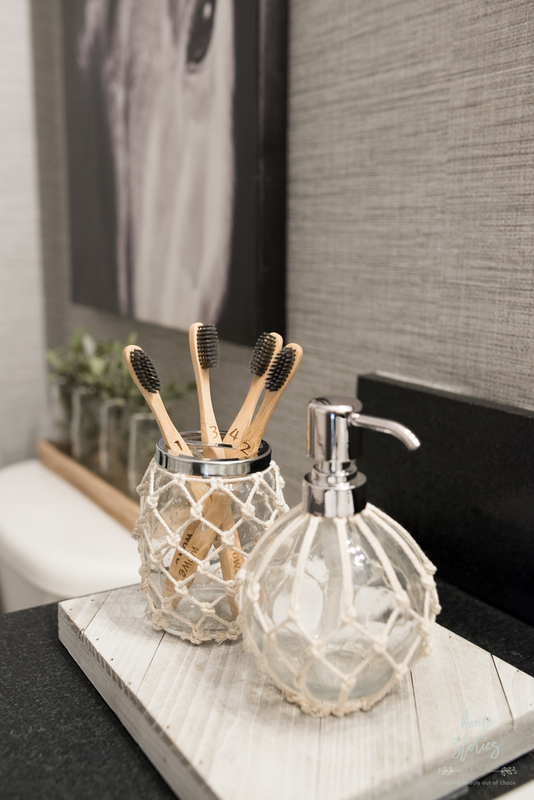 Thinking outside the box with your accessories is a great way to use what you already have on hand in new ways. I’ve had this beautiful Better Homes & Gardens Nautical Glass Lantern for awhile now and decided to use it as a vase with some cut branches from the yard. 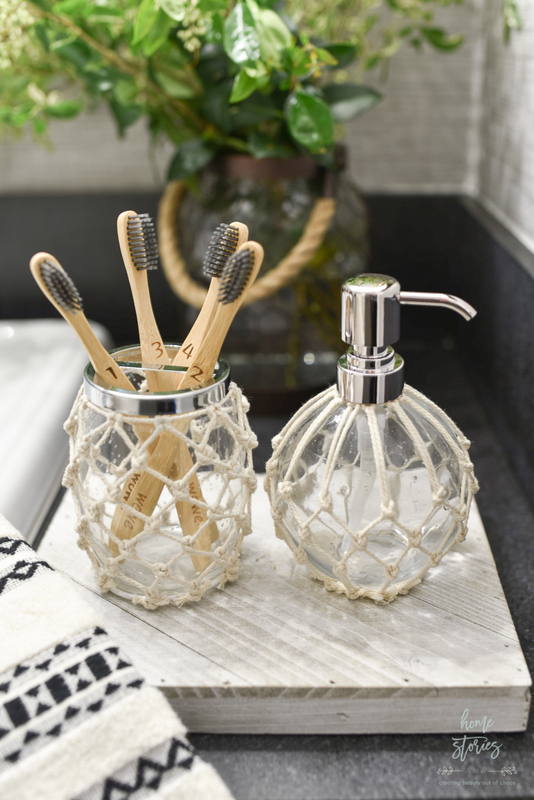 The chicken wire pattern on the lantern plays beautifully with the rope texture on the soap dispenser and toothbrush holder! I have to give a shoutout to my friend Layla at The Lettered Cottage for this decor idea below! She shared this exact idea on her Instagram stories of using a wood craft frame from Walmart’s craft section as a cute little bathroom tray. 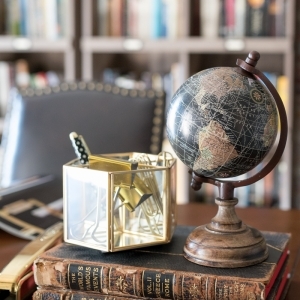 Again, here is a great example of how to think outside the box when accessorizing your space! 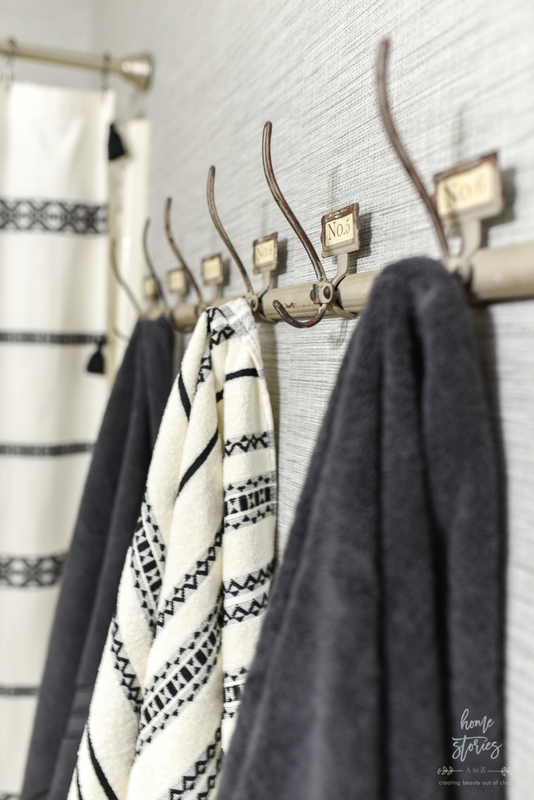 Tip 4 for Creating a Budget-Friendly Bathroom Makeover: Use your towels as accessories! 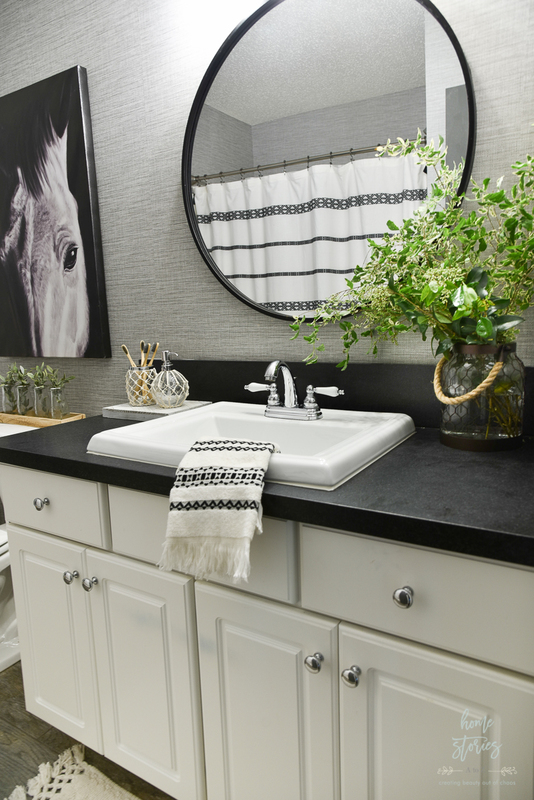 Bathroom towels are obvious necessities in your bath, so why not incorporate them into the design and show them off? All of my boys (big and little) somehow have a mental block against folding a towel and hanging it over a towel bar. It’s a battle I decided to give up on long ago and since have embraced the idea of the blessed bath hook! My Better Homes & Gardens at Walmart towels look beautiful and are easy for my boys to keep up off the floor. 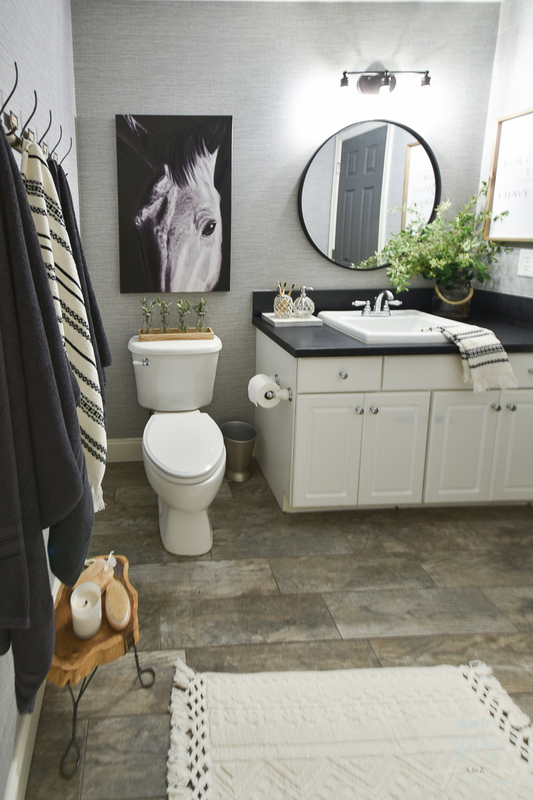 Thanks for stopping by to check out my budget-friendly bathroom makeover! I hope you gleaned some tips for your own home. I welcome you to please pin this project to one of your boards on Pinterest and share these ideas with others! 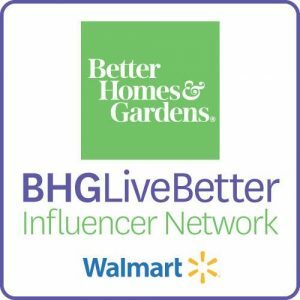 The Better Homes & Gardens at Walmart products used in this post are listed below. 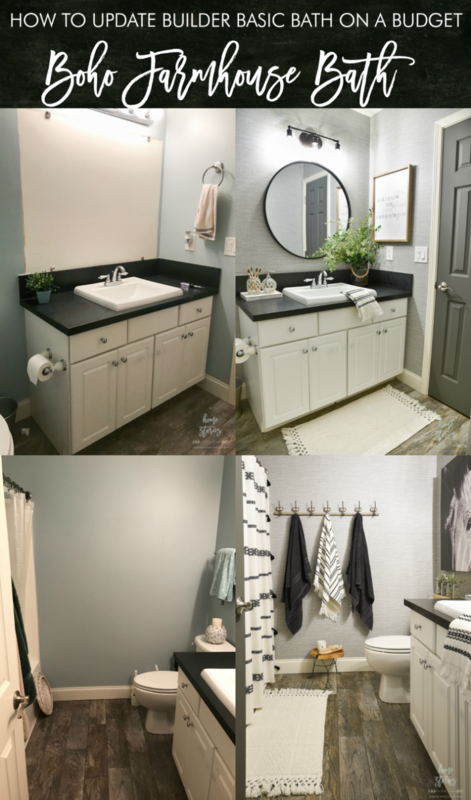 For a full list of all of the products I used to create my boho farmhouse bathroom makeover please click here. Did you apply the wallpaper yourself or did you hire it out? Thanks! 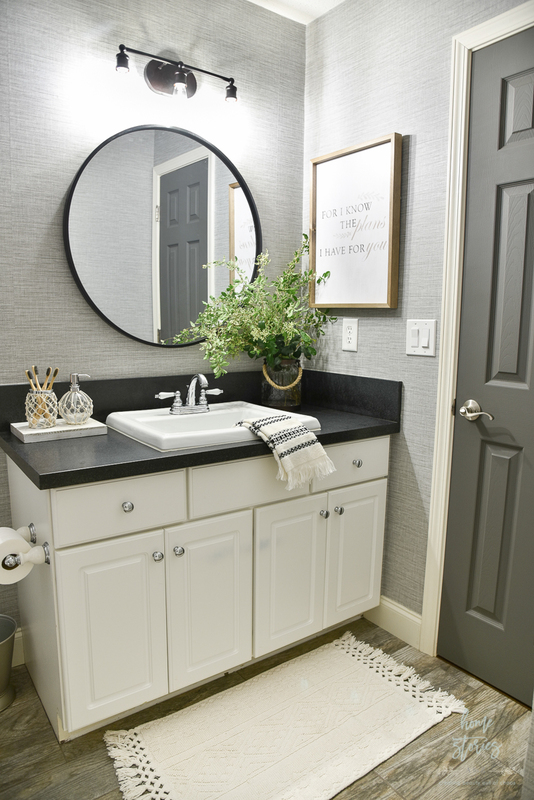 The bathroom makeover looks amazing! I love the texture look of the walls and all the new accessories! They make the look!